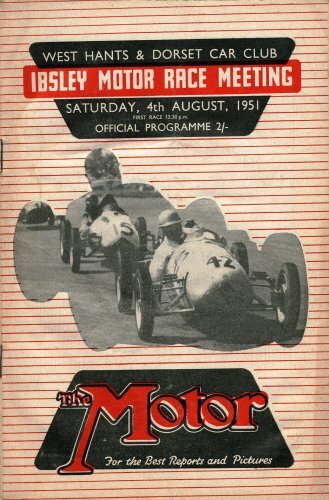 1951: Ibsley Circuit, situated at RAF Ibsley, on the Fordingbridge to Ringwood Road in Hampshire, UK, staged its first car meeting. Organised by the West Hants & Dorset Car Club (WH&DCC) on a track which Autosport described as “tricky enough to have good spectator appeal”. The programme consisted of sports cars races, Formula III and Formule Libre. The lap record for the day was set by Ray Merrick in his Cooper-Norton-JAP at a speed of 79.83 miles per hour (128.47 km/h). Dennis Poore won the main event of the day for racing cars over 500cc in his Alfa Romeo 8C from Oscar Moore (HWM) and Sydney Allard in an Allard. 1956: Lee Petty dismounted his car in disgust on the 32nd lap, climbed the flagstand, grabbed the red flag from the official starter, and waved the scheduled 100-mile #NASCAR Grand National race at Tulsa, Oklahoma, US to a halt. Dusty conditions blinded the drivers and Petty acted on his own to prevent a catastrophe. The race was never completed or rescheduled. 1956: Curtis Turner survived a race of attrition to score a win in the NASCAR Convertible Series at Columbia (South Carolina, US) Speedway. Turner started second and finished two laps ahead of runner-up Glen Wood. Pole-starter Joe Weatherly, Turner’s teammate in Pete DePaolo-owned Fords, came home third despite retiring with a flat tire with four laps left. Only eight of the 25 starters were running at the finish. 1957: The Argentine racing driver Juan Manual Fangio won the #German Grand Prix at Nürburgring to clinch his record-breaking fifth, and last, world title. The race was also the 24th and last #Grand Prix win of his career, at the time a record. Unlike the other drivers Fangio started the race with the fuel tank of his Maserati half full. He drove carefully until the halfway stage at which point he refuelled. He came out of the pits with a deficit of 45 seconds to make up. The 46 year old proceeded to break the track record in lap after lap, eventually overhauling the race leaders to take the chequered flag. 1957: Buck Baker won the 100-mile NASCAR Grand National event on the road course in Watkins Glen, New York, US. Baker dominated the race, leading flag to flag. 1963: John Surtees in a Ferrari won his first #Formula One race, the German Grand Prix. and Jim Clark (Lotus) finished second for the only time in an Formula One race (cover image). Jim Clark led away from pole in his customary fashion. Behind him Lorenzo Bandini spun in front of Innes Ireland who collected him, Willy Mairesse had an accident, and Chris Amon sustained a knee injury when the steering broke, catapulting him into the trees. Graham Hill retired leaving Clark to battle away with John Surtees and Trevor Taylor before engine problems befell Taylor. When Clark’s engine went down to just 7 cylinders, Surtees was able to pass him easily to lead him home to take his first #F1 victory. Richie Ginther completed the podium. Gerhard Mitter finished in a superb fourth place in his home race from Jim Hall and Jo Bonnier. This race was notable for being the only time Jim Clark ever finished second in a World Championship race. 1968: Jackie Stewart, racing a Matra-Ford with a broken wrist, won the German Grand Prix held at the Nürburgring in mist and torrential rain rendering the track treacherous and visibility virtually non-existent. He won the race by a margin of four minutes in what is widely considered to be one of the greatest victories in the history of Formula One. Stewart thought it was not his greatest race — which he believed was the 1973 Italian Grand Prix at Monza, where Stewart unlapped himself on the entire field. 1985: Michele Alboreto won the German Grand Prix for Ferrari, his fifth and last Formula On victory. This event was the first occasion on which an onboard camera was used in a race; one was attached to François Hesnault’s Renault. 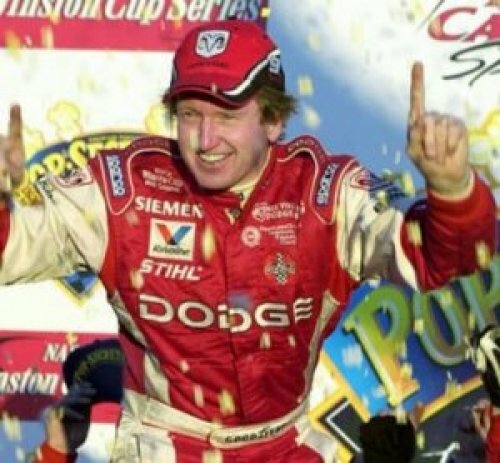 2002: Bill Elliott, 46, won the ninth Allstate 400 at the Brickyard, becoming the oldest driver to win the race. Indiana native Tony Stewart started from the pole for the race and led the first lap, becoming the first driver to accomplish both feats in the Indianapolis 500 and Allstate 400 at the Brickyard. 2007: Fernando Alonso was relegated from pole to sixth on the grid after stewards declare he deliberately impeded Lewis Hamilton in qualifying for the Hungarian Grand Prix. McLaren forfeited all points won from the race for the constructors’ championship. 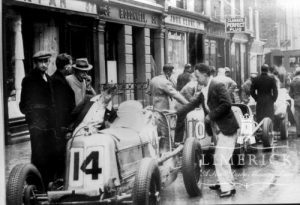 1935: The first Limerick Grand Prix or Cuirt Luimnighe race, took place in Limerick, Ireland. The circuit had a length of 2.76 miles, along O’Connell Street – William Street – Roxborough Road – Carey’s Road – Rossbrien Road – Punch’s Cross – O’Connell Avenue – O’Connell Street. There were two chicanes on O’Connell Street. The 55 lap handicap race was won by Luis Fontès (Alfa Romeo). 1935: Oliver Bertram, driving the 8-litre special Barnato-Hassan Bentley racing car, set the all-time Brooklands outer lap record with a time of 69.85 seconds, attaining an average speed of 142.60 miles per hour (229.49 km/h). However this record stood for only 2 months 2 days, as on 7 October John Cobb regained the title in his Napier Railton with a speed of 143.44 miles per hour (230.84 km/h). Bertram won the Easter Short handicap race in 1935 and with John Cobb took first place in 1937 in the BRDC 500 Kilometres Race – a shortened version of the 500 Miles Race. He was awarded the British Racing Drivers’ Club gold star twice – in 1935 and 1938. 1956: 45 year old Argentine Juan Manuel Fangio won the German Grand Prix at Nürburgring and broke Hermann Lang’s 17 year old lap record in a Mercedes. 1961: Walt Hansgen drove a Maserati Tipo 63 V12 to victory in the SCCA National event at Bridgehampton, New York, US. 1961: During practice for the 1961 German Grand Prix, American Phil Hill became the first person to complete a lap of the Nordschleife (the 14-mile ‘northern loop’) in under 9 minutes, with a stunning lap of 8 minutes 55.2 seconds. He had driven at an average speed of 95.3 mph in his Ferrari 156 ‘Sharknose’ Formula One car. Even 50 plus years later, the highest-performing road cars have difficulty breaking 8 minutes without a professional racing driver, or at least a driver very familiar with the track. 1962: Jack Brabham entered German Grand Prix with a car of his own construction, the BT3, but was forced to retire. The race was won by Graham Hill for BRM. 1962: Jim Paschal rolled to victory in the Nashville 500 (Tennessee, US), leading 307 of the 500 laps on the half-mile asphalt track at the state fairgrounds. Paschal finished four laps ahead of runner-up Richard Petty to claim his 12th win in NASCAR’s top series in a 1-2 sweep for Petty Enterprises cars. Buck Baker came home third, seven laps off the pace. 1970: Racer Jerry Titus (41), the 1967 Trans-Am Champion, died from injuries suffered a month earlier at Road America in Elkhart Lake, Wisconsin, US. 1973: Jackie Stewart won his 27th and last Grand Prix victory in Germany. Held just a week after the horrid death of Roger Williamson at Zandvoort, March and Hesketh Racing withdrew their efforts, while the regular combatants races on in his memory. Qualifying saw Stewart rise to the fore with an excellent lap to claim a seventeenth and final pole start, sharing the front row with quali-specialist Ronnie Peterson. In front of the familiar 100,000 strong crowd it was Stewart who shot into the lead of the race, while teammate François Cevert moved into second after a strong start. Peterson only managed to threaten them for the first half of the opening lap before an engine failure ended his day, leaving the Tyrrell duo to dominate for the rest of the afternoon. As the Tyrrell twosome disappeared, an on loan Jacky Ickx moved into third, Ferrari allowing McLaren to use their star driver while they solved their car’s inherent issues.Niki Lauda, Carlos Reutemann and Peter Revson then stole the show with an intense fight for fourth, although it was over in a flash as Revson kissed the barriers and Lauda broke his wrist after going straight on at Kesselchen. Reutemann therefore inherited fourth before retiring just after half distance, promoting Carlos Pace, while the two Fittipaldi brothers briefly battled for fifth. Ultimately the injured Emerson had to give way to the older Wilson, with the pair only five seconds apart at the flag.Yet, out front, there was no-one who could deny Stewart the win, the Scot crossing the line with teammate Cevert a couple of seconds behind in a perfect display of dominance. Ickx matched his best finish of the season with third ahead of fastest lap setter Pace, with the two Fittipaldis completing the points. Other highlights saw Jackie Oliver actually finish a race for Shadow, Graham Hill finish on the lead lap, and a grief stricken David Purley finished the race a lap down in his March. Stewart became the champion for a third time but withdrew from the US Grand Prix after Francois Cevert was killed during qualifying. 1995: British driver and software author Mark Colton (34) was killed in practice for a hillclimb at Craigantlet, Northern Ireland. He is widely considered one of the best drivers never to have won the British Hill Climb Championship. 2001: Jeff Gordon won the eighth Allstate 400 at the Brickyard, becoming the first three-time winner of that prestigious event. 2007: Lewis Hamilton won the Hungarian Grand Prix for McLaren, his third win and tenth podium of the season. It was also memorable for an incident in the Saturday qualifying session, between McLaren teammates Lewis Hamilton and Fernando Alonso. Hamilton went into the race with a 2-point advantage in World Championship points over Alonso and was 11 points ahead of 3rd place man Felipe Massa after a chaotic European Grand Prix, whilst McLaren held a 27-point lead in the Constructors’ Championship over their main rivals Ferrari. Ralf Schumacher scored his last ever World Championship points at this race. Japanese former Super Aguri driver Sakon Yamamoto filled the second Spyker car, replacing European GP leader, German Markus Winkelhock. Sebastian Vettel, the youngest Grand Prix point scorer made his second Grand Prix start replacing Scott Speed at Scuderia Toro Rosso. Controversy hit the qualifying sessions when Alonso held Hamilton up in the pit lane, denying Hamilton a chance to record a final lap time. Stewards later dropped Alonso five places down the starting grid of the race, putting him in sixth while Hamilton started in pole position. McLaren were also told they would not score any Constructor’s Championship points in the race and wouldn’t be presented with a winning constructor’s trophy on the podium if one of their drivers were to win the race. The team stated Hamilton’s hold-up was not Alonso’s fault (although Alonso gave the stewards a different explanation, that he was inquiring about his tyres), and that Hamilton had disobeyed team orders to let Alonso pass him, which put the two drivers out of sequence for their pit stops. McLaren had initially expressed their intent to appeal the Constructor’s points penalty but ultimately withdrew their appeal after subsequently losing all their Constructor’s points as penalty for the espionage scandal.